adidas Originals celebrates the upcoming start of the 2014 World Cup in Brazil by releasing beautiful kicks to pair with it. 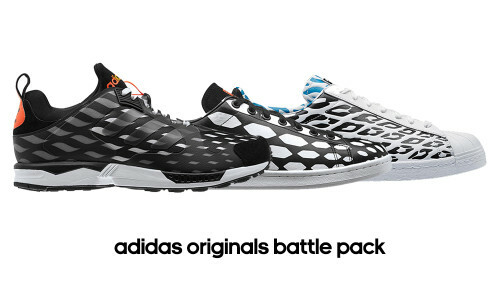 Five pairs of classic silhouettes are packaged in the the adidas Originals Battle Pack, and they include the adidas Samba, the adidas Stan Smith, the adidas Superstar 80s, and the adidas ZX 5000 Response. Representing the nature of the tournament, every pair has an element of white with fire gold accents to represent its trophy. Available at our adidas Original Collective stores, select Footaction stores and online. Print article This entry was posted by hhcblog on June 5, 2014 at 2:49 am, and is filed under Footwear. Follow any responses to this post through RSS 2.0. You can leave a response or trackback from your own site.